Traditional standby generators create heat when making electricity, from both the engine block and the exhaust flue, but it is wasted heat. A CHP unit collects that generated heat and re-purposes it into hot water, increasing its efficiency dramatically. The resulting production of electricity and heat from the same generator system produces lower energy bills, a reduced carbon footprint and optional back-up power. By recycling this previously wasted energy with a CHP unit (also known as a cogeneration unit) you are effectively increasing the benefits and value of the gaseous fuel source you are already consuming. Thanks to the effective utilization of “waste heat” through combined production of heat and power up to 40% of the energy contained in the fuel is saved compared to the separate production of heat and power. Total Power is best positioned to offer Combined Heat & Power (CHP) as an additional power solution for Canadian companies looking to save money and reduce their carbon footprint. We have the experience! With over 60 years of experience in the generator business you can confidently turn the project over to us. 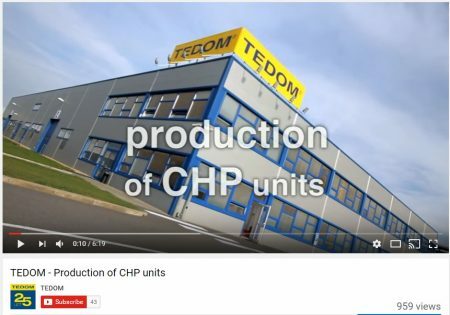 We provide a wide range of CHP solutions from 35kW to multi-MW. Our experts determine the CHP equipment that’s right for you, whether it’s an open set, acoustic set, containerized set or part of a pre-fab power plant. We detail the savings and benefits of our suggested solution. We explain the build budget and offer fixed maintenance costs. Total Power provides services for Tedom product across Canada and is the lead sales partner in Ontario .